Lucky Tiger Video Slot Guide & Review - Casino Answers! Lucky Tiger is a 5-reel, 88-line video slot developed by Realtime Gaming, featuring stacked wild symbols, scatter wins, multipliers, three free spins featureS and two progressive jackpots. You can play the Lucky Tiger Real-Series Video Slot at Bovada. Bets on the Lucky Tigers video slot are $0.01, $0.02, $0.03, $0.04, $0.05, $0.06, $0.07, $0.08, $0.09, $0.10, $0.25, $0.50 and $1 per line. You can select from 1-88 lines on the Lucky Tiger slot machine. You can bet as little as a penny on the Lucky Tiger penny slot and as much as $88 per line. Lucky Tiger has a decent betting range, suitable for most casual players and high rollers. You can manually skill stop the reels on the Lucky Tiger slot game by pressing the “Stop” button at any time during a spin. To play the Lucky Tiger online slot, select your bet and press the “Spin” button. 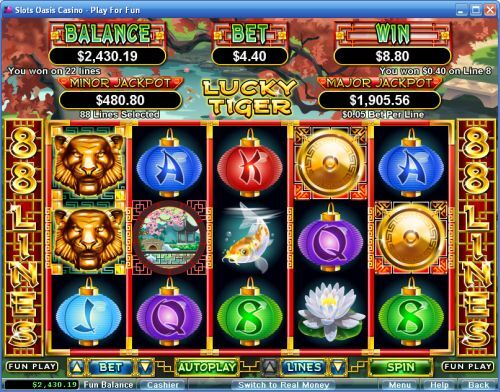 The highest paying symbol in the Gong and Fortune free spins features is the Golden Tiger symbol. 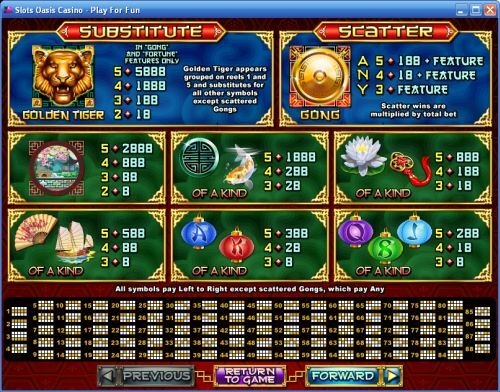 If you hit 5 Golden Tiger symbols in one of these features, you will win the 5888 coin top fixed jackpot. In the regular slot game, the highest paying symbols are the Garden symbol (2888 coins), Medallion and Goldfish symbols (1888 coins). The Golden Tiger symbol is a stacked wild symbol that substitutes for all symbols except for the Scattered Gong symbol. During the regular slot game, it appears stacked on reels 1 and 5 only. The scatter symbol on the Lucky Tiger video slot is the Gong symbol. 4 or 5 Scattered Gongs on the reels of Lucky Tiger will pay out 18X or 1888X your total bet. If you hit 3 or more Scattered Gong symbols anywhere on the reels of the Lucky Tiger slot game, you will trigger one of three features. Click on a Gong symbol to reveal one of three special features. All of these free spins features can result in some very big time winnings when you play the Lucky Tiger video slot at Bovada! The first is the Lucky Tiger free spins feature where you will be awarded 8 free spins with a 3X multiplier. If 1, 2, 3, 4 or 5 scatter symbols appear during the Lucky Tiger feature, you will win 1, 2, 5, 8 or 25 additional free spins. If you select the Gong feature, you will win 8 or 18 free spins. The Gong symbol will act as a wild symbol during the Gong feature. After scatter wins are paid out, the Gong symbols will morph into Golden Tiger wild symbols before payline wins are paid. If you re-trigger the feature, you will win 5 more free spins. The final free spins feature is the Fortune feature. You will receive 8 free spins with the multiplier matching the free spin number (the first free spin has a 1X multiplier while the eighth has an 8X multiplier). During the Fortune feature, after scatter wins are paid, both the Gong and Garden symbols will morph into Golden Tiger wild symbols. If you re-trigger the Fortune free spins feature, you will win 5 more free spins. All additional free spins will have an 8X multiplier. Lucky Tiger has two progressive jackpots – Minor Jackpot and Major Jackpot. At the time of this writing, the jackpots were at $530 and $1,956 respectively. Both of these progressive jackpots are won at random and can be won at the conclusion of any spin. Progressive Jackpot wins are added to other game wins. Random Jackpot contribution is no more than 1.5% of the total Return to Player. Hit the “Autoplay” button to open the autoplay settings. You will be able to set the number of spins, set it to stop when the jackpot is won, stop if a win exceeds or equals (any amount you input), stop on any win, stop if your balance increases/decreases by any amount you input and stop once the feature is triggered. You can stop Lucky Tiger’s autoplay mode using the “Stop Auto” button to deactivate it. Lucky Tiger has a lot of interesting, very unique features. Also, it has two progressive jackpots and some very nice payouts as well. You can play the Lucky Tiger video slot when you sign up and make a deposit at Bovada! Where can players from the United States play the Lucky Tiger online slot game? American players are welcome to play the Lucky Tiger video slot at any RTG online casino, including two of our favourites – Bovada. How can I win the Lucky Tiger progressive jackpots? Both of the Lucky Tiger progressive jackpots are random jackpots, so you can win them simply by playing the Lucky Tiger slot machine. If you want to better your odds of winning one of the Lucky Tiger progressive jackpots, you can try increasing your bet per line. Where can I play a free flash game of the Lucky Tiger slot game? Unfortunately, there is no Lucky Tiger flash game available at this time, but you can play a flash casino version of the Tiger Treasures Video Slot at Bovada.